Pima Community College is navigating wholly new territory. 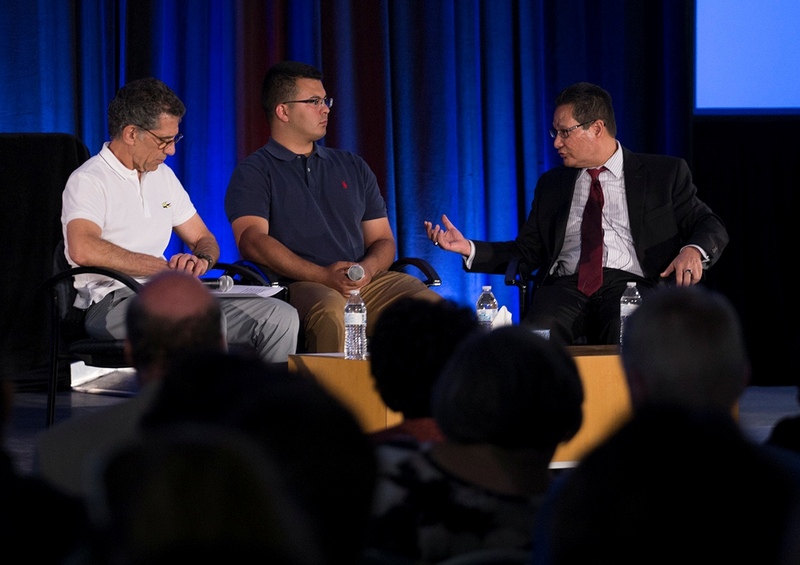 More than 1,200 PCC faculty members, students, staff, Governing Board members, and administrators took part in an all-College meeting and workshops last week at West Campus to address that reality. The members of the College community are “pioneers of the present,” to use faculty member David Bishop’s evocation of anthropologist Margaret Mead’s famous phrase. We are going where PCC has not been before, and are facing a series of threats that, if unmet, puts the College at risk. We face very serious challenges in a variety of areas. The State of Arizona has zeroed out appropriations to PCC for Fiscal Year 2016. Our enrollment has declined beyond pre-Great Recession levels; the reality is that fewer students are enrolled at PCC than in any year since 2000. Though the Higher Learning Commission has removed PCC from Probation, it has placed us on Notice. Notice means the College is now in compliance with the HLC’s Criteria for Accreditation, but remains at risk of being out of compliance with the Criteria for Accreditation and the Core Components. The consequences of failure, too, are spelled out clearly. In February 2017, after the HLC has made a focused visit by September 2016 to PCC to determine whether we have made progress in 11 areas, “The HLC Board will determine whether the institution has demonstrated that it is no longer at risk for non-compliance … or if the College has not demonstrated compliance, whether accreditation should be withdrawn or other action taken,” according to a letter from HLC President Barbara Gellman-Danley. I am always open to a good idea, and when faculty member Rick Rosen suggested bringing everyone together for a discussion of the College’s future, I called the College’s first-ever mid-semester meeting, and we closed the school for a half-day. PCC needs to hear from all stakeholders about the problems, both new and decades in the making, which must be resolved, along with an outline of developing solutions. Put another way, we gathered to begin answering the question, “Why does PCC exist?” It is a crucial question. As Starbucks CEO Howard Schultz says, in any endeavor, why matters more than what or how, because why reflects an institution’s core values. We are at a Strategic Inflection Point, a term coined by Andy Grove, then-CEO of Intel Corp. A Strategic Inflection Point is that which causes a fundamental change in business strategy. “Nothing less is sufficient,” Grove said. Many of the assumptions Pima makes about its markets, its competition and its customers need to be re-examined and retooled at a fundamental level in order for us to succeed in a brutally competitive environment. The frank conversations and workshops that followed centered on how best to meet the College’s future challenges. Our goal for augmenting revenue is to increase enrollment by 1,000 full-time student equivalents over each of the next five years. The College has the capacity to manage this increase. We can increase enrollment through several initiatives, including PimaOnline, the Education Master Plan, International Education and Workforce Education. Regarding expenditures, we will reduce costs by $2.5 million a year to align infrastructure to community needs. A hiring freeze, attrition and other strategies will help close the gap. Also, creative ways to increase revenue and-or reduce expenditures are being collected through our College-wide GREAT IDEAS survey. Each day, so many faculty and staff at PCC help our students succeed. Our challenge is to provide evidence that teaching and learning at PCC result in an effective cycle of assessment. We also need to offer superlative service to students from the moment they consider PCC through graduation and beyond. Everyone – full-time and adjunct instructors, administrators, the Governing Board, temporary, exempt and non-exempt employees — must play a part. Heaped upon Nelson Mandela were injustices that would have crushed a lesser person or driven him to retribution. Yet, Mandela said, “I knew that if I didn’t leave my bitterness and hate behind I would still be in prison.” I am sorry that many employees were hurt by the overly negative approaches of the past. However, PCC must free itself from its history so that we can focus our energies on our students and our future. Given the seriousness of our challenges, we must let go of the past so we can move forward immediately. Let me close with the story of a student whose experience illustrates the promise and power of education and the personal relationships that make PCC a great school. David Lee is a native Tucson who graduated from Pusch Ridge Christian Academy with a diploma but without a plan for the future. At the urging of his siblings, he visited PCC Counselor Melinda Franz. They talked — about his interests, dreams and talents. David entered the Radiologic Technology program, studied diligently and was aided financially by scholarships from the PCC Foundation. Since November he has worked at Radiology Ltd.; he is the 79th employee there to have gotten a start at PCC. “PCC gave me the life I have today,” David says. PCC has changed the lives of tens of thousands of people like David over our almost five-decade history. As we change to adapt to 21st-century realities, we must remain surefooted and focused on the institution’s North Star of student success, community engagement and diversity. All PCC employees should ask themselves, “What can I do to move the College forward?” We are Pima, and working together, we can accomplish great things. Students are among our most important investors, giving us their time, money and dreams. We cannot and will not let them down. My presentation and video of the day’s proceedings are available on the College’s website. This entry was posted in Uncategorized and tagged accreditation, budget, enrollment, finance, Higher Learning Commission, Pima Community College on March 31, 2015 by pimachancellor.